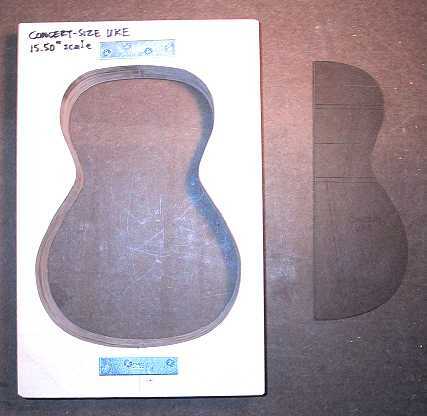 For another neat site on building a concert ukulele, check out Al McWhorter's excellent site --- it's much more detailed than mine!!! 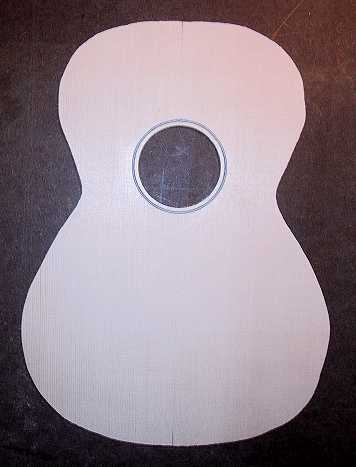 I have decided to try my hand at building a ukulele this summer. 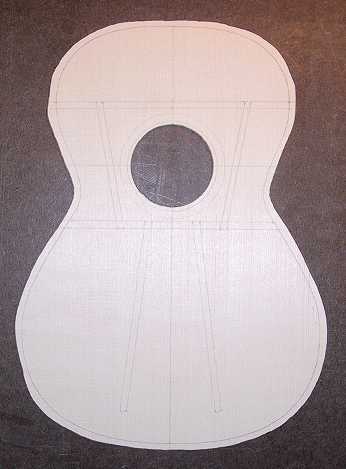 All I have is a blueprint to go by --- I've decided to build a "concert" size ukulele for this first one. Maybe one of the things that got me interested in building a ukulele was that recording of "Over the Rainbow" with "Wonderful World" done by Israel Kamakawiwo`ole --- I'm sure you've heard it --- it was the background music used when Mark Greene died in the TV show, "ER". From what I've heard, it was also played in the movie "Finding Forrester" and "Meet Joe Black". Here are some photos from my beginning of this project. Below is the mold I built, by using the template/router method to rout the six pieces of birch plywood, which I then glued together. To the right of the mold is the 1/4" hardboard template for the ukulele. To the right are the top (Engelmann spruce) with a simple rosette black/white/black ring, and another view of the top with the bracing pattern marked out.